Fashion & Style Influencer list includes more than 190 contacts for bloggers (Names, email addresses and social media links (Facebook, Twitter, Instagram, Pinterest) including Fashion Toast, Brooklyn Blonde, Andy Heart, Gabi Fresh and We Wore What. Your new media list arrives as an instant, digital download to your inbox. Easy! Looking for an easy way to contact fashion bloggers and style Influencers? The first step to landing the powerful, gorgeous, jump up and down blogger/social coverage you seek is knowing who to contact. Get instant access to fashion bloggers who are ready and waiting to write about or wear your product, build awareness for your brand and help you to drive sales. You could pay thousands for a subscription to a traditional media database filled with contacts you neither want nor need, or pay an employee to spend hours researching a list (that you’d still have to review). Seriously, why bother! It’s a pain, it’s expensive, and your time and peace of mind are worth so much more! 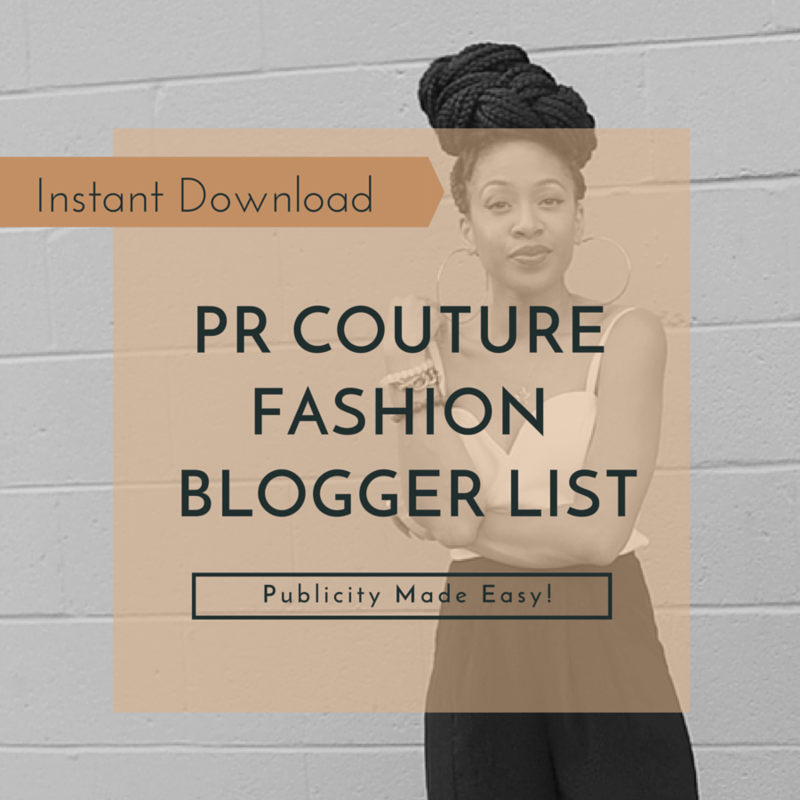 Go with the list created by fashion PR professionals and be done with it! Names, email addresses and social media links (Facebook, Twitter, Instagram, Pinterest) in a spreadsheet that’s pretty nice to look at, as well. Your new media list arrives as an instant, digital download to your inbox. Easy! This list features more than 190 contacts for bloggers including Fashion Toast, Brooklyn Blonde, Andy Heart, Gabi Fresh and We Wore What. Our guarantee: The industry moves at an insanely fast pace, and so do its major players. If you find that any of the contact information is out of date or incorrect, simply drop us an email at [shop@prcouture.com] with [List Update] in the subject line and we promise to get you an updated or replacement contact/outlet within 72 hours. We will honor any updates for six months from date of purchase. Happy pitching! Due to the nature of the information included, there are no refunds for this purchase.